Source: The College Board. (2015-2017). CMCSS AP Data. Location: Instruction and Curriculum Department, Clarksville-Montgomery County School System. Unpublished raw data. Retrieved on October 13, 2017. We are pleased to release our first impact metrics for the College Board’s AP English Language and Composition test scores in the Clarksville-Montgomery County School System. Students who participated in The Graide Network during the 2016-17 academic year achieved a record high pass rate of 92% on the AP English Language and Composition exam, an increase from historical average pass rates for students of the same teacher, which averaged 80% over the prior four years. While many factors influence test results, school leadership believes The Graide Network is among the most helpful and innovative programs they have adopted, both strengthening student writing and expanding teacher capacity. Research has shown that feedback has a significant influence on learning. It has an immediate impact on outcomes and leads to lower failure rates, fewer suspensions, and better attendance. Most significantly, the relationship between feedback and achievement has proven consistent regardless of race, socioeconomic status, grade level, or school setting (Bellon, Jerry J., et al. Teaching from a Research Knowledge Base: a Development and Renewal Process. Merrill, 1992.). To be effective, feedback must be goal-oriented, prioritized, actionable, and student-friendly. It must also be timely, ongoing, and consistent. Providing this kind of personalized, robust feedback is prohibitively time-consuming for teachers and often impossible to do on a timely, ongoing and consistent basis. 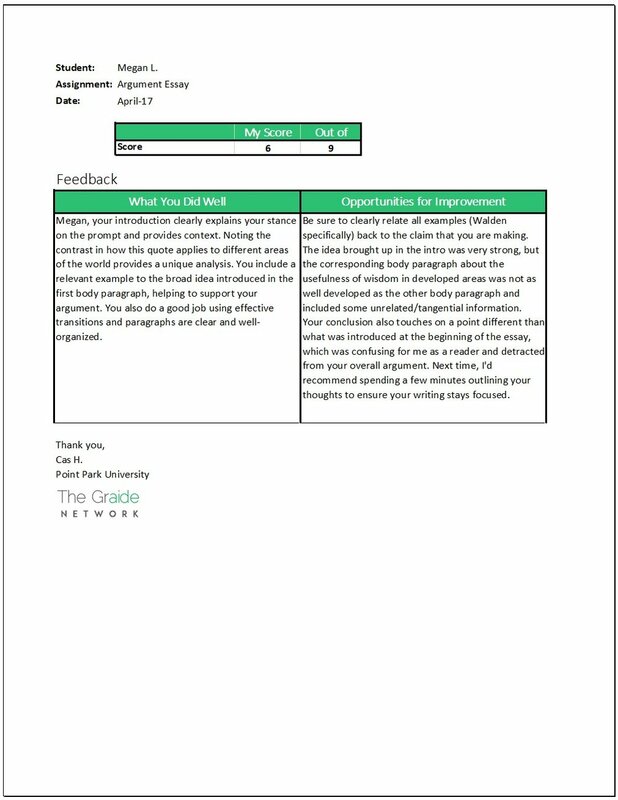 The support of Graiders helps students receive timely, high-quality feedback on a more frequent basis and adds a unique, outside perspective that benefits both students and teacher. “In-depth feedback. I can tell that you read the papers carefully. Grades were accurate - pretty much the same that I would have given." Each student receives a feedback report that highlights their score on the 0-9 point College Board rubric and feedback separated into areas of strength and areas for growth. Graiders are evaluated based on the accuracy of their scoring and their ability to provide personalized feedback to students that is aligned to our framework, "The 7 Hallmarks of Effective Feedback" (read about the Hallmarks here). In addition to providing personalized feedback to each student, Graiders also provide feedback to the teacher about the class’ performance as a whole. Here are two examples from the AP English Language and Composition essays administered in the fall and spring semesters, respectively. Class areas of strength: Students excelled in providing relevant textual evidence to support their arguments. They provided accurate depictions of various contemporary and historical events to substantiate their claims. Most students also had a clear introduction to set the direction of their paper. Moreover, they maintained an objective tone and there weren’t any major conventional or stylistic errors. Class areas for growth: As is common, one of the primary issues with these papers was a lack of analysis, or even elaboration, on the evidence provided. A lot of students resorted to summarizing their evidence rather than explaining how it's linked directly to their claim or how it serves to further build their argument. In addition, I think students could work on incorporating stronger transitions into their essays to show how their ideas are connected with each other. This will make their papers more coherent overall. Regardless, students still have a little over 5 months until the actual AP exam, so I'm confident that with more instruction and practice, they will further sharpen their writing skills and ace the exam! Class areas of strength: Many individuals provide an interesting hook that engages the reader. This was really important to engage my attention. I especially enjoyed when it all came together in the conclusion. Maturity of writing is typically appropriate. Please be sure to avoid contractions, an easy fix to mature one’s writing. For the most part, the class did well with tense and avoiding pronouns. Class areas for growth: Specific examples were the biggest issue, and deep analysis! For your argument to be really strong, it is so important to have concrete examples from texts read in class, current events, real-world examples, etc. The papers that included this were much clearer than those that did not. Even if they included specific examples, they must analyze them and relate examples back to the thesis. If telling a story in their paper, ask students to consider including it in the introduction and conclusion, rather than making it the body of the paper.